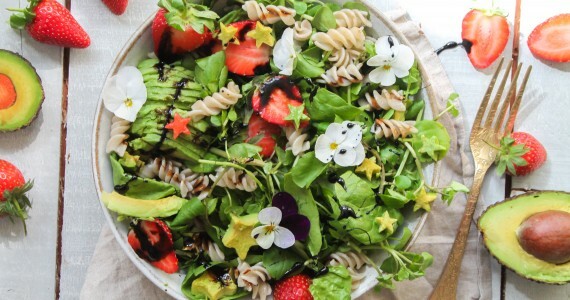 While avocado, strawberry and pasta may not be a typical combination you think of for pasta salads, trust us...this works! Fresh, delicious and simple to whip up, you'll wonder why you never paired avocado and strawberry together before! Pour the balsamic vinegar and coconut sugar into a small saucepan, whisk until combined, then heat until it comes to the boil. Turn down the heat until it thickens (this is a balsamic reduction) but remains thin enough to drizzle, then remove from the heat – five to ten minutes. Tip your cooked, cooled pasta into a large bowl, then toss through the green leaves, mint, strawberries and avocado, stirring well to combine. Season to taste, then toss through the olive oil and balsamic reduction until combined. Serve in bowls and enjoy.